Scleral lenses are rigid gas permeable lenses that have an extra-wide diameter that covers the white part of your eye (the sclera). For almost a century, scleral lenses were regarded as having limited use – yet that viewpoint has changed drastically in the past ten years. Nowadays, sclerals are the fastest growing part of the gas permeable contact lens market. In addition to providing a smooth cornea and clear vision for keratoconus and other corneal irregularities, many people praise their newfound visual comfort of wearing scleral lenses for dry eye. At , our , eye doctor fits more and more hard-to-fit patients with these specialty contacts. Yes, many people turn to sclerals only after other contact lenses were uncomfortable or ineffective. Yet, that isn’t the case for everyone. Scleral lenses can correct many common refractive errors and are more stable than many conventional lenses, often making them the most suitable solution for an active lifestyle. Also, there is a new trend to use scleral lenses for dry eye. Because of how sclerals vault over the cornea, they create a pocket between your corneal surface and the lens. This pocket fills with moist tears that soothe dry eye. There is very little scientific evidence that indicates complications arise due to wearing scleral lenses over the long term. For more details, schedule a consultation in our eye care clinic. 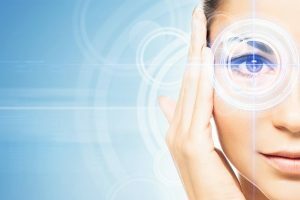 Our eye doctor keeps up with medical developments and can answer all your questions about the latest advances in scleral contact lenses. The initial price of scleral lenses may be slightly higher than standard conventional contact lenses. Yet, their superior value justifies the cost. You will benefit from better vision clarity and enhanced comfort. Also, if you suffer from a corneal disorder, your insurance plan may cover scleral lenses. When it comes to scleral lens care, you must clean and store them in a recommended disinfectant – in the same way as regular contact lenses. And if you’re worried about how to insert scleral lenses, our optometrist will provide clear instructions and plenty of trial time. We won’t send you home with your new scleral lenses until you are comfortable handling them.